A stipple plate engraving printed in sepia ink, engraved by Charles Knight after the drawing by Henry William Bunbury, published in London by W. Dickinson 1785. In this charming, albeit disarming, scene we see street entertainment from the less politically correct reign of George III. Outside "The Old King of Bohemia" a bear is chained and muzzled while its master encourages it to dance for the entertainment of the gathering crowd. A monkey swivels on a pole while a small boy provides musical accompaniment on his horn. 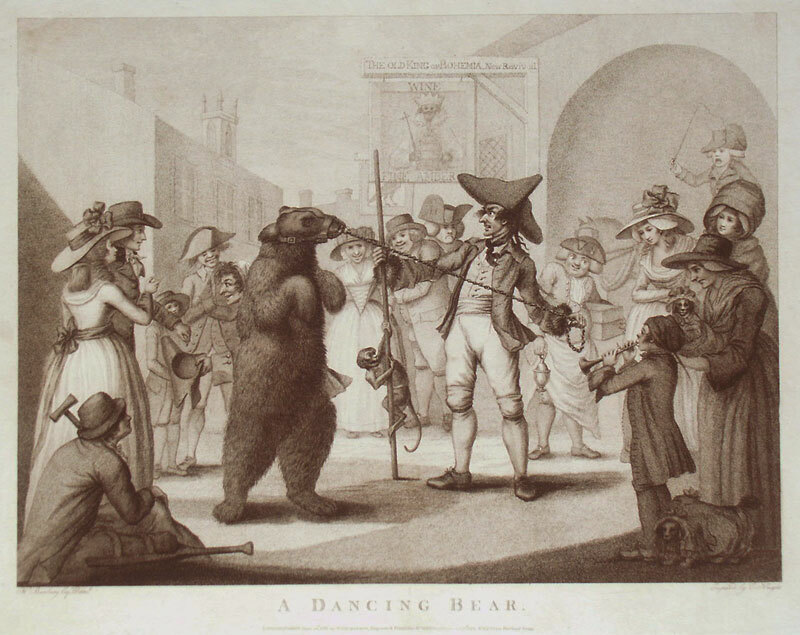 Dancing Bears were ubiquitous in England during the Middle Ages but by the eighteenth century their popularity had waned and they were confined to a small band of itinerant street and circus entertainers. Those that did survive often achieved celebrity status akin to that of the most famous actors of the day. Charles Knight (1743-1826) was an engraver, based in London, who studied under Francesco Bartolozzi and perfected the technique of stipple engraving upon copper plates. He was one of the many artists who responded to the increased demand for attractive "boudoir prints" that were fast becoming fashionable as accessories for interior decoration during the reign of George III. Henry Bunbury (1750-1811) was one of the best loved and well-connected caricaturists of Georgian England. He was educated at Westminster School and then Cambridge so his social connections gave him access to a very lucrative market. Unlike his contemporaries, Thomas Rowlandson and James Gillray, Bunbury never attempted political or malicious satire so his caricatures were gentle and inoffensive in nature and did not cause the consternation or outrage of other artist's work.